A deliciously simple summery salad; great to practice KS1/2 cutting skills but easy to make with any age group as no cutting is required - for early years simply tear, break and shred! Ask the children to get creative with their serving style to make it eye-catching and not only taste great but look delicious too. Follow a recipe; follow food safety & hygiene rules; tidy away; use measuring spoons and cups; chop using bridge/claw technique; tear ingredients; crumble ingredients; whisk; garnish and decorate. Knife, chopping board, large mixing bowl, large serving spoon, measuring jug, fork. 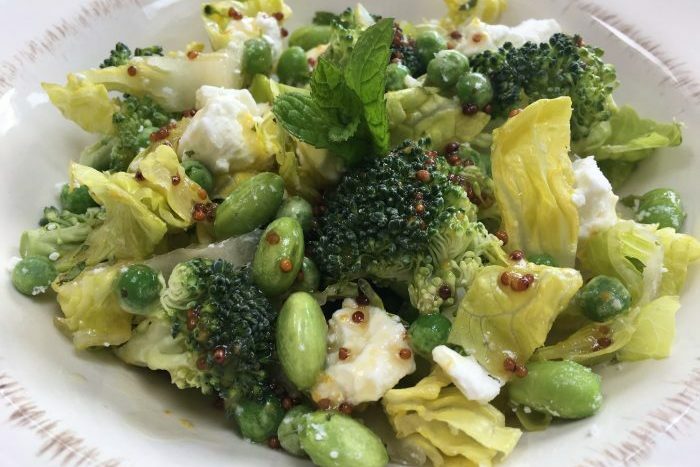 Place the broccoli, peas, lettuce, broad beans and cheese into a large mixing bowl and mix together to combine. In a measuring jug add the oil, vinegar, honey and mustard and whisk with a fork. Just before serving pour the dressing over the salad and mix. 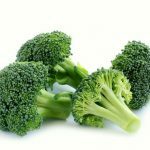 Vegetables are so good for us, especially when we eat them raw! Low in fat, sugar and calories and high in vitamins and minerals. 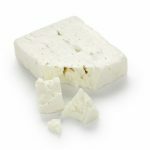 Feta cheese is high in saturated fat and salt, but it is strong tasting so you can get away with using smaller amounts. Choose reduced fat options where possible. Salad Dressing can be high in fat because oil is usually the main ingredient. Using unsaturated oil, such as olive oil, is a healthier choice but still only use small amounts.